Talking with the guys who make it happen. Current Holden Special Vehicles are superbly sorted in their real-world ride/handling abilities. Unlike some overtly sporting cars, the suspension has been set up to cope with off-camber corners, with bumps, with occasional potholes. But these are cars that on smooth roads also handle very well indeed. Underpinning these outcomes must be a specific engineering development philosophy - it's sure not something which is arrived at by chance. To find out what makes HSV suspension happen, we talked to suspension engineer Mark Beasy and engineering manager John Clark. It was a wide-ranging discussion that also covered some aspects of aftermarket suspension mods. What is suspension engineer Mark Beasy attempting to achieve when he develops the suspension on an HSV model? What does he like about a good-handling car? "During the development I drive in several different driving styles to get the car balanced for a variety of different customers," he said. "I like a car with a smidge of understeer - but not too much, I am not a fan of loads of understeer because the average customer is not going to get onto the power to balance the car. [Instead] they're going to get on the brakes to slow the car down. "Also, it's important that the car's not too reactive, so that anyone can get in and drive it. And drive it fairly hard and be fairly rough and still get away with it, while having loads of fun." John Clark added that the cars were set up to be stable, even with late braking into a corner. He said that the rear toe link had been a big advantage to HSV in that it allowed better control of the rear suspension. Having the front and rear damping set so that the cars pitched less also gave advantages over successive waves of bumps. "The pitch control keeps the cars having a very level feel," John said. Keeping lateral stability is also important, and damping plays a large part in this. Mark said trying to control the roll centre and how the car reacts with the damping was critical in the cars. "If you haven't got enough rebound on the front, you turn in and the front will lift, because the roll centre shoots out there somewhere," said Mark gesturing at the far wall. "So immediately that loads up the rear, and as soon as you turn in, bang! you get oversteer." HSV use 'digressive' damping, where the rate of increase in damping versus piston velocity is non-linear. "As you go higher in piston velocity, instead of just going higher and higher in compression force, it actually decays off and becomes flatter on the graph," Mark said. "The benefit is that when you hit a big bump, you don't get that shock coming through the car. The car is more compliant. You can't just go stiff and expect the car to have grip." 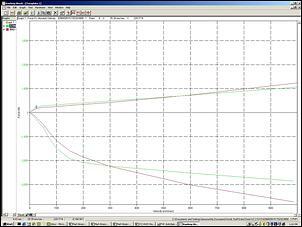 Shown on this damper dyno graph are the VX (red) and the VY (green) dampers. It can be seen that in the later model dampers, at higher bump shaft velocities the damping force gets stronger at a slower rate than with the previous model dampers. The engineers said HSV spend a lot of time matching the suspension to the tyres. They said that the type of tyre selected played a critical role in determining the understeer/oversteer balance. "I always knew that the tyre manufacturers could alter the construction of the tyre to alter the understeer/oversteer balance. I knew they could - but I'd never experienced it until recently. But then I got a set of tyres that could [immediately] turn the car into big understeer..."
But if the marriage between specific tyres and a specific suspension tune is so vital, what about those customers who change the tyres on their HSV models? Engineering manager John Clark said that in his experience, this seldom happened. "You can make a car diabolically dangerous by putting the wrong tyres on it," added Mark. HSV don't use any plastic bushes in their suspension revisions - in fact, they keep the standard Holden bushes throughout. But when the aftermarket has a love affair with plastic replacement bushes, why don't HSV use them? "We don't want to have feedback through the steering column or the cabin space," John said. He also said HSV had found durability problems with plastic bushes, problems the traditional rubber bushes didn't have. He said people didn't realise the complexity of the standard bushes. "People think that it's a rubber moulded bush - and that's it. But the bushes in our cars have voids in certain areas to control movement in different ways." Mark said the rear suspension design used on the Holdens was a classic example of where voided bushes needed to be used. He said the bush allowed a fore-aft movement to take place. Without the voided bush, the suspension arms would be fighting each other as the wheel went through its vertical movement. "It would actually bind-up if it was a solid bush," Mark said. He said by the use of voided bushes you could more strongly control the impact in one direction versus another. Sway bars are widely used in the aftermarket as a suspension fix. What do the two engineers think of this simple bolt-on approach? John said a car with bigger sway bars turns in nicely but can be very skatey. "The actual grip of the tyres will be reduced. You may feel as if you're going quicker but if you get interruptions part way through a corner (like a bump), it will tend to really unsettle the car." "You're loading the outside tyre more so your inside tyre's not doing the work," Mark added. "My experience - outside of HSV - is that when you get an aftermarket suspension and actually compare it back-to-back with what you had originally, nine times out of ten you'll find that you're not as quick." 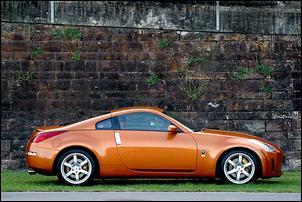 AutoSpeed's recent test of the Nissan 350Z has attracted worldwide attention. 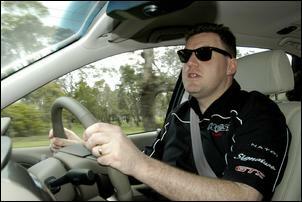 Basically, on real world Australian roads we thought the car lacked grip and handled poorly, although on smooth racetrack style surfaces it could work very well. The HSV engineers have driven the 350Z - what did they think of it? "It had bad axle tramp and it was just miles too stiff," said Mark. He said he and another suspension engineer went out in the car for about two hours - and that was enough. "It handles quite well," Mark said. "Lots of understeer on tight corners, though. But for a road car the ride was terrible. You'd put it on the trailer, you'd drive it to the racetrack, you'd drive it around the track and you'd put it back on the trailer." But John Clark said the way the car was set up may have been the Japanese engineer's brief and that it may suit Japanese roads and Japanese conditions. 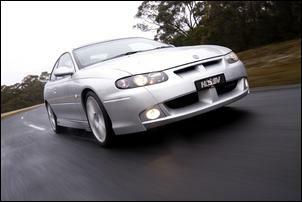 One car where we were unimpressed by the suspension is the Holden Monaro. 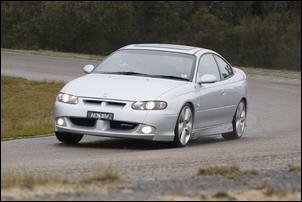 But the HSV Coupe - nearly the same car but with revised suspension and steering ratio - we thought was very good. 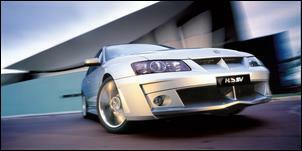 How did Holden get the two-door wrong and HSV get it right? "The Coupe is actually quite a difficult car to tune the suspension in," Mark said. "But once you get the Coupe just right - whether it's a luxury touring or a performance suspension - you can transfer that into a sedan. But if you develop a suspension for a sedan, it's highly unlikely that it will work in a Coupe because the transfer from the front wheels to the back wheels when you hit a bump [while cornering] is so much faster." But if the Coupe has the same wheelbase as the sedan, why are bumps transferred more quickly? "The torsional rigidity on a Coupe is actually quite high," John said. "It's up over the sedan by about 40 per cent. When you turn in, the response front-to-rear gives it quite a different feel." The engineers said that it was the altered torsional rigidity of the two-door over the sedan which had caused Holden to slow the steering ratio of the Monaro. This contrasts with discussion at the time which suggested it was the altered weight distribution of the shorter-tailed Monaro body.